Tonite I made for my mum Suji Cookies - recipe posted on 8 Oct.
My sis came at about 9pm to lend me a helping hand and we both made another easy peasy stuff, i.e. 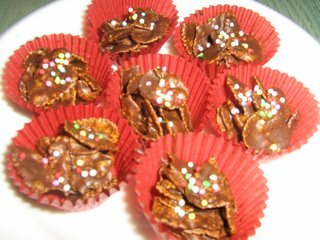 Chocolate Coated Cornflakes. The recipe given below is for a small batch. My sis and I made twice as much as the recipe given below. Melt coating chocolate using double boil method. Once it has melted, put in the cornflakes and mix well. Spoon into paper cups and sprinkle with hundreds and thousands. Air dry and then keep in an airtight container.